Utah’s junior senator joins the trumpian gaslight brigade, with misleading, false, and crazy-making claims about America’s public lands and how Utahns feel about the mountains and redrock country that make Utah a Western wonderland. Posted in This 'n' That. The best part of publishing is the combination of people, places, ideas, and books that Mark Bailey and I get to experience with Torrey House Press. We hit the road to the north Bay Area last week and what amazement we found. Why go with woo when you can take in awe? When people engage with the beauty and wonder of the nature, openings emerge that can help us relate and to respond to its realities. Here’s a brilliant look at the night sky, the origins of us, from the dark skies of Torrey, Utah. Science is wowzy! This is my first deep sky object capture in a while and the first after modifying my camera to accept more red in the Ha wavelength. 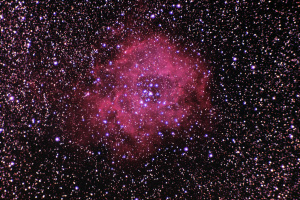 This cosmic rose is about 5,000 light years away near Orion in Monoceros. The red is nebula matter (hydrogen?) that is heated up by the hot stars in the center that formed from the same matter.